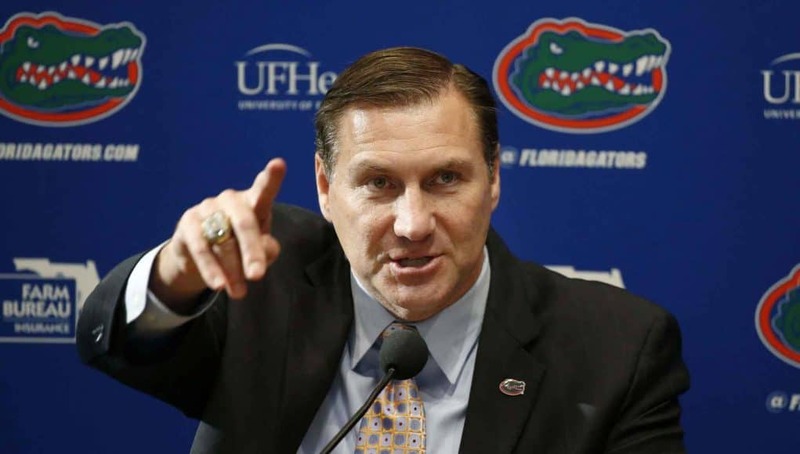 The Florida Gators will host their first junior day under new head coach Dan Mullen on Saturday in Gainesville. This weekend’s visitors list is loaded with top talent expected in Gainesville as the Gators look to start the 2019 class strong under Mullen and his staff. As is the case with every junior day, these days are big at getting guys on campus and starting the relationship process with not only 2019 guys but 2020 guys. Here’s a preview of this weekend’s expected junior day visitors list for Saturday in the Swamp. 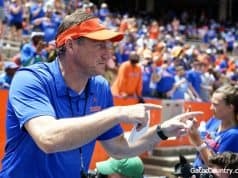 Mullen made it a point on signing day to say that the Gators were going to focus on instate targets more going forward and this weekend is loaded with instate prospects. Several big names on the offensive side of the ball are expected in town. Leading the way is tight end Keon Zipperer (6-2, 240, Lakeland, FL. High) who is one of the top prospects in the state and someone the Gators are in good shape with early on. Receiver Dionte Marks (5-11, 179, Deland, FL. High) picked up an offer from Florida this week and the Gators are the early team to beat heading into this weekend. Miami receiver commit Jeremiah Payton (6-3, 180, Fletcher, FL. Duncan) pledged to Miami this weekend but says he intends to give the Gators a look in his recruitment. Getting him on campus this weekend is a step in the right direction. Joining those two receivers this weekend is receiver Isaiah Washington (6-3, 192, Jacksonville, FL. Trinity Christian) who is the younger brother of former Gators safety Nick Washington. The Gators will host USF tight end commit Kamari Morales (6-3, 232, Tallahassee, FL. Lincoln) this weekend. The Gators haven’t offered him yet but that could change this weekend. Joining those guys will be two offensive lineman in lineman Ruben Rodriguez (6-5, 280, Miami, FL. Gulliver Prep) and lineman Michael Tarquin (6-5, 290, Belleview, FL. High). Tarquin currently holds an offer from Florida. Athlete Jerjuan Newton (6-0, 170, Clearwater, FL. Central Catholic) is also expected in town this weekend as he projects to play on the offensive of the ball. Receiver Maurice Goolsby (6-5, 196, Dunnellon, FL. High) is scheduled to make his first trip back to Florida since he decommitted from the Gators. Goolsby still likes Florida a lot heading into the visit. While the offensive side of the ball is loaded, the defensive side of the ball is even more loaded with big name visitors for this weekend. The Gators will have several top targets on campus. The Gators didn’t sign a defensive tackle last year but they will host one of the top instate targets this weekend when defensive tackle Tyler Davis (6-2, 261, Apopka, FL. Wekiva) visits town. Joining Davis will be his teammate defensive end Norell Pollard (6-1, 260, Apopka, FL. Wekiva) who is looking for a Florida offer. Defensive end Derick Hunter (6-4, 280, Fort Myers, FL. Dunbar) has been a Florida/Miami battle for sometime and that continues heading into the visit. The Gators will try to put some distance between them and the Canes this weekend. Defensive end D’Sean Perry (6-4, 225, Miami, FL. Gulliver Prep) is another guy hoping to earn an offer this weekend. Defensive back Jaden Davis (5-10, 165, Fort Lauderdale, FL. St. Thomas Aquinas) has been high on Florida for a while now and that has only continued under Mullen. The Gators will look to continue their momentum with him this weekend. Athlete Mark Richards (6-1, 194, West Palm Beach, FL. Wellington) projects better on the defensive side of the ball and while his plans are up in the air for this weekend, he’s trying his best to be in Gainesville on Saturday. Miami is the biggest threat for Richards. Former Gators commit linebacker Marcus Tillman (6-2, 220, Orlando, FL. Jones) will make his first trip to town since leaving the class. The Gators are still in great shape for him heading into this trip. Defensive back Kaiir Elam (6-0, 177, North Palm Beach, FL. The Benjamin School) wants to visit Florida but he says it will depend on his basketball schedule on Saturday. 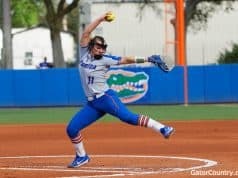 The Gators are in good shape with Elam either way. Joining those defensive backs is defensive back Semar Melvin (6-0, 155, Fort Lauderdale, FL. St Thomas Aquinas) who is looking for a Florida offer. The Gators will also host one of their commits on Saturday when athlete Trent Whittemore (6-3, 190, Gainesville, FL. Buchholz) visits the Swamp. The state of Georgia is once again loaded with top talent in 2019 and several of those guys will visit Gainesville on Saturday. Leading the way is Georgia receiver commit Jadon Haselwood (6-3, 187, Ellenwood, GA. Cedar Grove) as the Gators try for a flip on one of the best in the country. The Gators will also host Georgia offensive line commit Luke Griffin (6-5, 275, Chatsworth, GA. North Murray) who is considered one of the best in the state for 2019. Joining those two guys will be yet another Georgia commit in Georgia defensive back commit Jalen Perry (6-1, 175, Dacula, GA. High) who the Gators have offered. Defensive tackles Rashad Cheney (6-3, 270, Ellenwood, GA. Cedar Grove) and Jaelin Humphries (6-5, 310, Lawrenceville, GA. Mountain View) are also scheduled to visit. Last but certainly not least is another talented defensive back visiting when defensive back D.J. Turner (5-11, 170, Suwanee, GA. North Gwinnett) visits Gainesville on Saturday. Florida will also host a few other out of state prospects this weekend from other states around the country. Linebacker Jammal Abrams (6-3, 224, Birmingham, AL. Jackson-Olin) picked up an offer from Florida in January. Tight end Luke Deal (6-5, 230, Greenwood, SC. Emarald) is scheduled to make his first visit to campus on Saturday. Tight end Nick Gallo (6-3, 225, Southampton, PA. Council Rock South) will also make his first appearances in Gainesville this weekend. 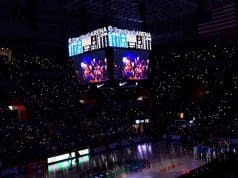 The Gators will host a few 2020 prospects in town this weekend to go along with the many 2019 prospects.